The Mill’s London studio was recently approached by Tomas Georgeson, a talented painter and lecturer of Fine Art, specialising in the work of Rembrandt. Using the HTC Vive Tilt Brush, Tomas was hoping to discover new ways to explore old masterpieces, allowing him to view and reconstruct works using an unchartered medium. Following on from his initial visit, The Mill worked with Tomas to bring together the concept of a Mill | Experience X Tilt Brush Live event all day on Thursday 29th + Friday 30th September. 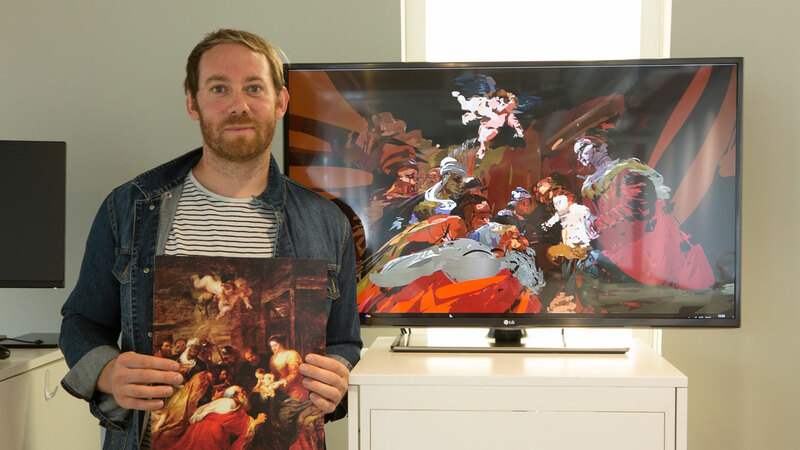 Staff and clients visiting the studio were able to watch a live stream of Tomas recreating the classic, ‘Adoration of the Magi’ by Rubens. After two days of painstaking work, Tomas had recreated this masterpiece in 3D form, allowing users to feel as though they were literally stepping into the Religious scene when wearing the HTC Vive headset. We caught up with Tomas to find out a little more about what inspires him and what he discovered during the Mill | Experience X Tilt Brush Live experiment. What first sparked your interest in VR? I suppose VR has always been in the back of my head since ploughing hundreds of hours into the first basic polygon computer games in the 1980's. Added to this is the fact that most painters, including myself, have always been concerned with virtual reality of a sort. Of course, a painter is usually aiming to make something which is meaningful and resonant. For a long while VR just wasn't at the level where an artist could achieve this because of the low frame rate, glitching and low polygon count which meant that any intention on the artists part was lost, they could either make work about bad computer graphics or give up. Now though, VR is beginning to reach a level where it can provoke an emotional response from the viewer and that seems to me to be as revolutionary as the invention of photography. What were the biggest limitations with Tilt Brush for you? I used the Tilt Brush at The Mill to warm up for my Rubens reconstruction and I must say that every time I use it, it seemed to have another intelligent update which improved the experience. Personally my painting relies upon transparent layers applied as a wash or glaze, this would be a great help, as would the ability to blend broad strokes allowing artists to build up increasingly detailed models. I'm also very impressed with the way that the texture of oil paint has been imitated so that it appears as if brush strokes are in the paint. To get this exactly right though I think it is necessary to think of paint as three dimensional, which of course it is. Were there any happy accidents creatively through adapting your style to the VR format? At first I think I tried to be too tight. This led to fairly accurate forms which lacked dynamism. Then I forced myself to paint as I paint in the studio. I worked with a broad flat brush which always creates a sense of energy in oil painting and the tilt brush was no different. I suppose you can best see evidence of this in the two cherubs, which have a real sense of energy and movement because as my old teacher used to say 'the paint is doing the talking'. I suppose the fact that one can achieve this kind of dynamism with the tilt brush is proof of what I have just said about the power of VR to provoke emotional reactions. What particular techniques did you use to stay true to the Artist’s style/intent while using this platform? I chose to paint Rubens partly because his technique lends itself to the tilt brush both in terms of his dynamic compositions but also the fact that he applied paint with such fluidity. From my earlier tests, in which I attempted to paint a single figure by Rembrandt, I noticed that the kind of marks that could be achieved did not yet lend themselves to what rembrandt was doing. With Rubens however you have a painter working to commission aiming to create the most dramatic images possible with limited time in which to work and this sounded like a perfect fit for my brief. What kind of painting styles/artists would you love to see go through the VR treatment? Firstly I am very keen to spend more time working with the Tilt Brush myself. I think I have only just begun to discover its real potential to make credible, meaningful artwork and I see that this where it’s greatest potential lies. Certainly it will be very useful to illustrators and commercial artists, as Glen Keane and others have already proven, but the idea that something resonant with meaning might be made is the aim for me. I'm not sure how that might come about but I'm going to have a bloody good crack at trying to work it out and I can’t wait to see others aim for the same goal. We’d like to congratulate Tomas for his pioneering work and for providing such great entertainment! To check out more of his work click here. To see the 3D model of the artwork, use the video below.